Chief of the Army Staff General Bipin Rawat has presented the President's Colours to two battalions of the Maratha Light Infantry regiment in Karnataka's Belgaum city. 23 Maratha Light Infantry and 24 Maratha Light Infantry were presented the President's Colours at the Maratha Light Infantry Regimental Centre. The President's Colours were received by Maj Shourabh Modak and Maj Karan Joseph of the two units, respectively. 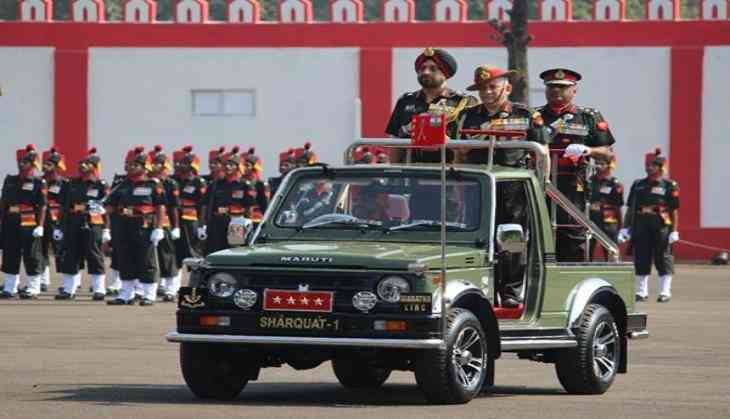 The ceremonial parade was commanded by Brigadier Govind Kalwad, Commandant, Maratha Light Infantry Regimental Centre. President's Colours to a battalion is an honour, bestowed upon in recognition of exceptional service, rendered by it to the nation, both during war and peace and adorns a place of pride in the Battalion. Maratha Light Infantry has a glorious history and has been conferred with eight Battle Honours, five Theatre Honours, five Maha Vir Chakras, five Ashok Chakras, 44 Vir Chakras and 15 Kirti Chakras along with various other decorations. The ceremonial parade was attended by a spectrum of high ranking military and civil dignitaries to include Mr Prabhakar Kore, MP (Rajya Sabha), Mr Suresh Angadi, MP (Belgavi Constituency). The Army Chief complimented the Regiment for its outstanding performance in all spheres of operational and peacetime commitments. He exhorted all ranks to continue striving for excellence and keep the nation's flag flying high in times to come. After presentation of colours, the Chief interacted with soldiers and their families. During his interaction with the troops, General Rawat awarded Commendation Cards in recognition of distinguished services rendered by selected officers and other ranks of the Regimental Centre. He was also taken around the Regimental Archives and Historical Section of Maratha Centre, showcasing the history of the Regiment.